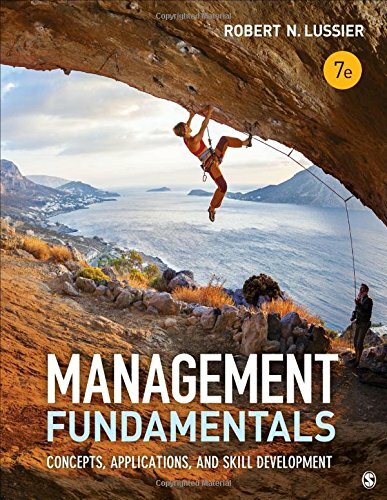 This Seventh Edition of Robert Lussier’s bestselling Management Fundamentals presents essential management themes through a three-pronged approach focused on concepts, applications, and skill building. Through a variety of applications, Lussier challenges millennials to think critically and apply concepts to their own experiences. Proven skill-building exercises, behavioral models, self-assessments, and individual and group exercises help students to develop their personal and professional skills. Fully updated throughout with 97% new references and over 1,200 new company examples, the Seventh Edition features 50% new cases, new self-assessments, and new applications and new coverage of current topics mandated by the AACSB.